A vintage People to People article discussing the history of that organization. See pg 5 for notes including Maupin & Mecaskey. Oct 2001 LJ World article announcing the “End of an Era” with Maupintour’s move to Las Vegas. Good historical timeline at end of article. Tom Maupin: "A meaningful itinerary is an Art." I was hired by Alton Hagen Director of Tour Managers at Maupintour in New York, primarily because of my knowledge of the Middle East. After turning down an offer of employment in 1982, because of much increased conditions, with my then employer in Britain, in 1984 I decided to ‘Make the Move.’ It was a career that would last over 30 years, until Maupintour, under its last owner, decided not to continue the Escorted Tour program. rather offering F.I.T. travel. 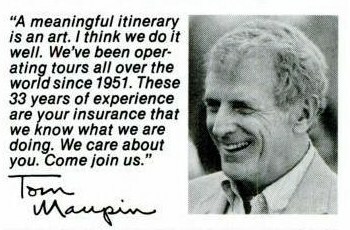 The thirty odd years I spent escorting Maupintour clients were the happiest of my career. Tom and Neil were Gentlemen, and The Product, one of the finest in the business. The name carried respect, and was known by suppliers as ‘A Serious Company’ My territory covered most of the World, some more difficult than others, but the Alumni were appreciative, educated, charming, and wanted something a little special, a little different, as Tom and Neil wanted, from the beginning. So great to hear from you, Lance, thank you for sharing this! You, of course, were a great asset for the company and its clients. Always professional, prepared, knowledeable, and thoughtful, in dealings with the office, suppliers, and clients. I (Jp) have many fond memories of working with you, but will probably remember until my last days your description of one year’s very avant garde performance of Peer Gynt at the Salzburg Festival! 🙂 Oh wow. Wishing you the best!